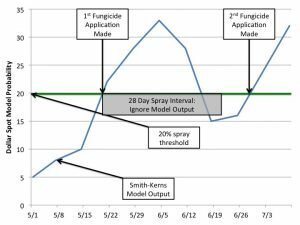 The Smith-Kerns Dollar Spot Prediction Model is a logistic-based model that uses a 5-day moving average of daily relative humidity and daily average air temperature to create a probability that dollar spot will occur on a given day. The model was created by Dr. Damon Smith and Dr. Jim Kerns and has been validated through years of additional field research conducted primarily in Wisconsin but also in Oklahoma, Pennsylvania, Mississippi, Tennessee, Connecticut, and New Jersey. The model can be used by golf course superintendents to more accurately time control measures to suppress dollar spot. What is the Smith-Kerns Dollar Spot Model? In brief, the model uses logistic regression to determine the probability that a particular event will happen. In our case, that event is the appearance of dollar spot. Note that the ‘e’ in the above equation is referred to as ‘Euler’s Number’ and is approximately equal to 2.718. Also note that since dollar spot is not active at temperatures below 10°C or above 35°C the model should be considered inactive when 5-day average temperatures are above or below those numbers. In rare cases, the model may indicate dollar spot activity is likely below 10°C or above 35°C when relative humidity is very high, but this should be ignored. One unique feature of this model is that it does not tell users when to spray, it simply gives them a probability of dollar spot occurring. So the first thing users will need to do is establish a spray threshold unique to their course. Work done at Wisconsin on ‘Penncross’ creeping bentgrass determined that a probability of 20% provided effective disease suppression, so that is a reasonable starting point. However, depending on the type of grass you have, the cultural practices you employ, and the environmental conditions at your facility you might have to use a higher or lower threshold. Once the spray threshold has been determined, a fungicide reapplication interval needs to be assigned for each application. During this reapplication interval you should theoretically be protected from dollar spot, no matter how high the probability is, and the model can mostly be ignored. Once the reapplication interval is reached, the model threshold can again be used to determine the next application. For example, in the figure below, note that the first time the model probability goes above our spray threshold is on May 21st, which is when we apply Emerald at 0.18 oz. We expect to get 28 days of control out of this application, so we essentially ignore the model output for 28 days. However, on day 29 the model probability is below the threshold, so we wait to spray again until the threshold is reached the following week on on June 27th. This process is repeated throughout the growing season. How can you use the model? We would also like to acknowledge the United States Golf Association, the Wisconsin Turfgrass Association, and the Oklahoma Turfgrass Research Foundation for providing funding for this project.